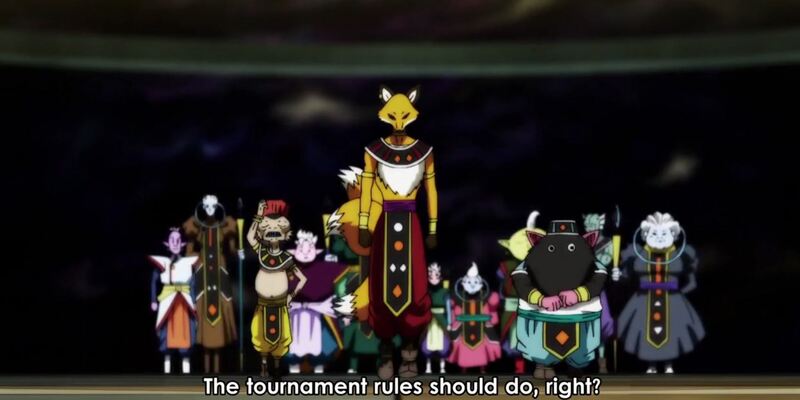 As the Supreme Kais, Gods of Destruction and Angels arrive for the Tournament of Power, they comment on the “plainness,” of the stage. They question how sturdy the fighting stage, The Great Priest states that the stage is made with Kachi Katchin. The Great Priest offers the Gods of Destruction a chance to test the stage. Liquiir, God of Destruction of Universe 8, Iwne, God of Destruction of Universe 1 and Arack, God of Destruction of Universe 5, all decide to battle each other. The three Gods do battle, moving at speeds that render them barley visible. They destroy the stage during the battle, ended with the three colliding huge energy blasts creating a large crater. Despite showing that the stage has flaws, the Gods are tasks with repairing the stage before the battle begins. Frieza arrives with Goku, finally completing the Universe 7 group. Unsurprisingly, Frieza begins to mock some of the Z fighters, many of whom he has personally killed (Krillin, Vegeta). Vegeta mocks Frieza for his Halo and he offers to give Vegeta his own. Goku is adamant that he will control Frieza. Shin explains that the group should work together, avoid fighting one on one. Goku and Vegeta, being 100 % Saiyans find the idea of fighting in groups unacceptable. Gohan and Piccolo decided that they will take control of the teamwork. Whis calls for the team to form a “friendship circle,” and team 7 are teleported to the fighting stage. 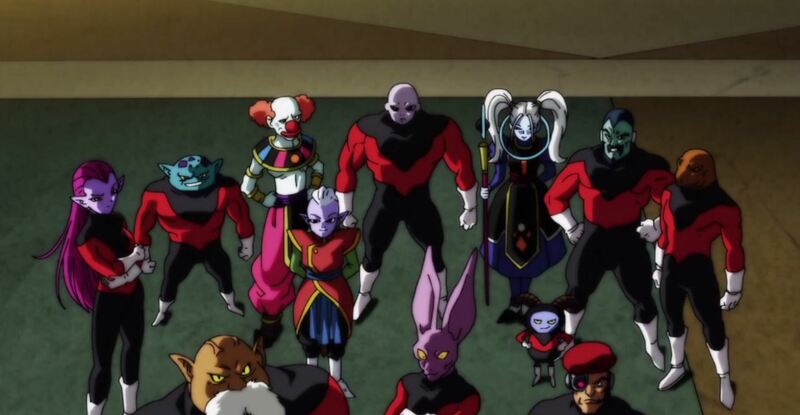 After Universe 7 arrives, team Universe 4 arrives and Android 18 notes to the group that the side of the stage leads to pure darkness. The fighters aren’t permitted to fly in the tournament, even though bird-like warriors are allowed. Meanwhile, Universe 6 arrives, and Frost introduces himself to the group, specifically to Frieza. Cabba, Hit, Caulifia and Kale are all introduced to the group. Caulifia is hostile toward Goku, while, Frost and Frieza plot with each other. 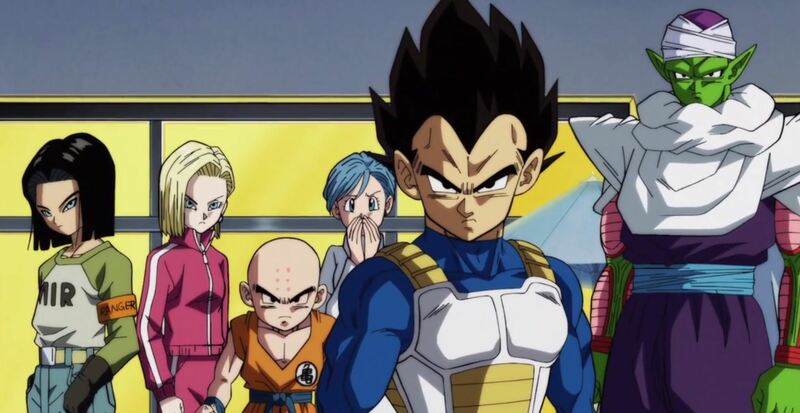 Team Universe 11 arrive shocking Goku, Vegeta and Cabba with their Ki. Goku introduces himself to them and is surprised by Jiren’s speed. The two Zen-Oh welcome everyone as the Tournament of Power begins. I have been disappointed by Dragon Ball Super. The animation early on was disappointing but it has improved since. I’m excited for this Tournament of Power and curious how the battle royal will work. I predict that some fighters will pair off and some of the fighters will remain a team. I wonder how Frieze and Frost will work together and when they will form a plan. Finally, how does Kale (Female Brolly) factor into the battle. I used to be a big Dragon Ball fan, but I haven’t watched Super. Another tournament just feels like more of the same and like you say the animation was really sloppy early on. It’s hard to get excited when one of the opponents is a clown. Who invited IT? lol, there isn’t a whole lot the series could do but have another tournament.